It's one thing to watch race hustlers like the Rev. Al Sharpton bellowing, "No justice, no peace." But when the attorney general of the United States makes false but racially incendiary claims about today's alleged "pernicious racism," we are in uncharted territory. Holder complains about different prison rates, different school expulsion rates and longer prison sentences for black boys and men compared to white boys and men. He equates "equal rights" with "equal results." In Ferguson, Missouri, after announcing federal investigation into the cop-shooting death of an unarmed black teen, Holder said: "I am the attorney general of the United States. But I am also a black man. I can remember being stopped on the New Jersey Turnpike on two occasions and accused of speeding. ... I remember how humiliating that was and how angry I was and the impact it had on me." The New Jersey Turnpike? The long-believed claim of "racism" on that highway has been investigated -- and debunked. Twice. Numerous complaints of DWB -- Driving While Black -- were filed by blacks driving on the New Jersey Turnpike. So the state entered into a consent decree, agreed to federal monitoring, and put their officers through, among other things, "sensitivity training." New Jersey commissioned a study, checking motorists' speed with laser guns and photographing drivers of vehicles going 15 mph or more over the speed limit. The result? It turned out that more speeders were black than white, which explained why cops pulled over black motorists so often. The U.S. Justice Department, which requested the study, did not want the results released to the public. Instead, they accused the researchers of using a "flawed methodology." Why shelve a report that disproves racism? Isn't it good news that Jersey troopers do not pull blacks over willy-nilly? Would this not improve race relations in New Jersey? No -- the facts did not fit the script. The next year, state police "stop data" showed that, on the southern part of the turnpike, 30 percent of the drivers pulled over were minority -- almost twice the 16 percent rate of minority stops elsewhere on the turnpike. So, amid new allegations that cops were targeting minorities, and to correct the "flawed methodology" of the previous researchers, New Jersey Attorney General Peter Harvey commissioned yet another study. The result? Again, it turned out a disproportionately higher percentage of drivers on that stretch of highway were black, and that blacks were more likely than non-blacks to drive 80 miles per hour or faster. Again, critics called the study's methodology "flawed." Over 20 years ago, black liberal Harvard sociologist Orlando Patterson said: "The sociological truths are that America, while still flawed in its race relations ... is now the least racist white-majority society in the world; has a better record of legal protection of minorities than any other society, white or black; offers more opportunities to a greater number of black persons than any other society, including all those of Africa." 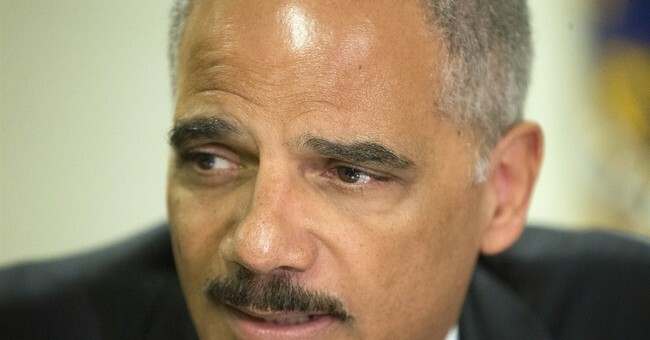 Holder, however, sees an America -- as to "race-relations" -- still mired in the 1950s. On a plane about 20 years ago, I met a black man who told me he was nearing 100 years old. What is the secret, I asked, to a long and happy life? Tall and ramrod straight, he said: "I tell my granddaughters to greet everyone with a big smile and an outstretched hand for a handshake. But those young girls don't wanna hear nothing about no smile and no handshake. That generation ain't got no appreciation for how easy they got it." Perhaps Holder feels guilty because he didn't do something more noble, like marching with MLK while braving attack dogs and water hoses. Perhaps Holder feels guilty because of his own personal success and fears the "people he left behind" will resent him if he doesn't sound empathetic. Holder's victicrat mentality might also explain why rich blacks -- including, for time, Oprah Winfrey -- belonged to Chicago's Trinity United Church of Christ whose pastor denounces the very drive for upward mobility that made Oprah Winfrey Oprah Winfrey. Why else would successful blacks pull up in their Lexus and BMW's to attend a church that denounces the work ethic that enabled them to drive nice cars, live in nice houses in nice, clean and safe neighborhoods? What sense does it make for a rich black man to listen to his pastor tell him how racism has held him back from becoming rich? Those "left behind" need a message of hard work and accountability and of seizing the opportunities uniquely offered by the United States of America. In a 1997 Time/CNN poll, a majority of black teens called racism a "big problem." But 89 percent of black teens called racism a "small problem" or "not a problem at all" in their own lives. In fact, nearly twice as many black teens than white teens called "failure to take advantage of available opportunities" a bigger problem than racism. Tell that to Mr. Holder.